All Ten80 Holidays chalets and apartments are exclusively rented through us. They are maintained by us all year round and in perfect working condition for your arrival. For all our guests who are self-sufficient and enjoy being left alone during their holiday, Ten80 Holidays offers a self-catered Option. Self-catered holidays include a warm welcome, concierge service before and during your stay, all linen, towels and slippers, a Ten80 Welcome Pack with carefully selected local produce, a basic amount of housekeeping and some other services relevant to each property. We make sure the chalet is perfectly prepared for you, show you around so that you know how everything works, take time to explain any events that are happening in Chamonix during your stay as well as fully brief you on any services you may have pre-ordered such as ski passes and/or guides and then leave you to enjoy your week in the knowledge that we are always available if you need us. Our concierge service is here to help advise and organise everything else for you, starting with transport to the chalet from Geneva, either shared or private, buying your ski passes for you so that you avoid queuing on the first morning, fridge filling before your arrival, organising ski and boot hire, ESF group lessons or private instructor or guides. No request is too small or big, with 12 years experience in the valley and a great team all you have to do is ask. Exclusively for the very best of our chalets only, we have put together a fully catered pack that includes everything and more. 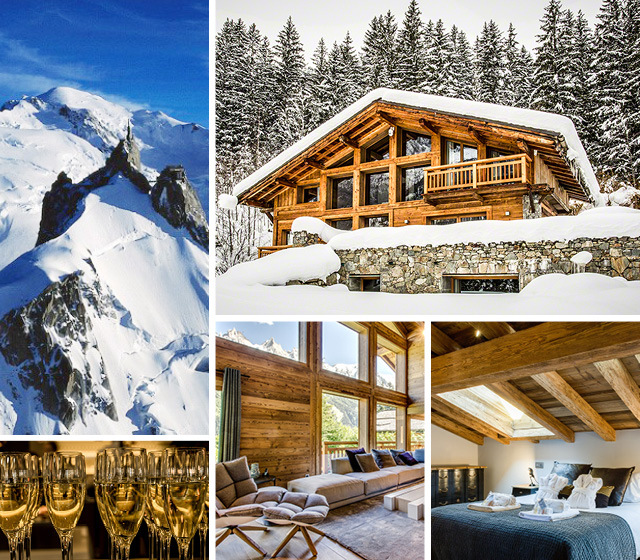 Please be patient while we are looking for your perfect chalet!